Another month, another Teeny Tiny Trip Around the World check-in, and I'm feeling pretty good about my progress. 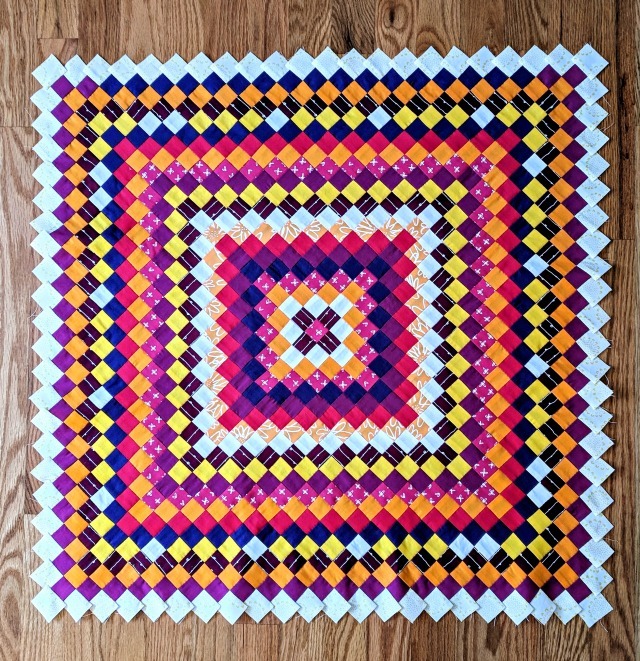 As I worked on pressing the row I was working on, fully planning on taking progress pics, I got inspired, and an evening in front of the tv motivated me to finish up that row - some 30 or so squares, which is alot for me to do in a day. But yay, I get to share a completed round, and am now debating what color I should do next. What made the last couple of rounds more interesting for me was to do a mixed-color round as I ran out of one solid, and I also introduced a new Karen Lewis print, which is subtle but I like it! Folks keep asking how big I'm going to make this thing, and I honestly don't know. Let's just say I'm not ready to be done, so I'll leave it at that for now. Here's to another round! I really like the subtle print and how it ties two of your colors together. It's lovely to see this continue to grow! so good! I finally dug mine back out after a break. each round just takes soooo loooong now! Wow, this is coming along beautifully. Your colours are all working so well. Your quilt is beautiful and I am mystified too as to how this quilt goes together. Does every piece have a set in corner? 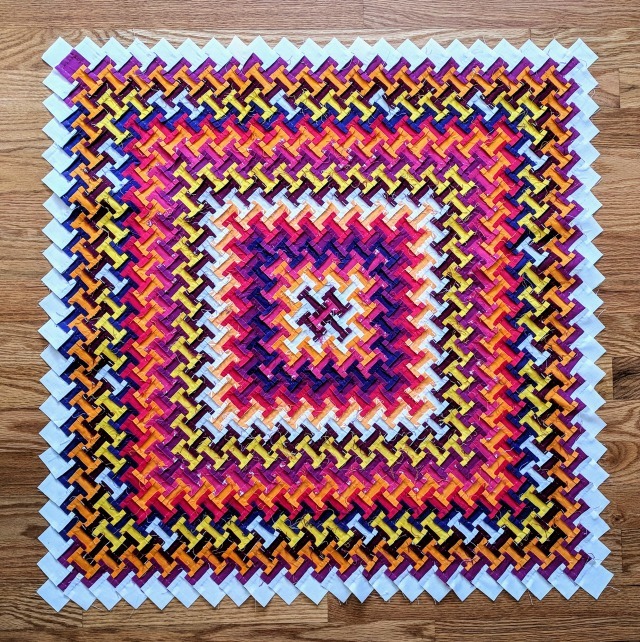 I made a SMALL one of these once and made a color chart and put it together diagonally. I don't have an email to reply back to you Anne, so hopefully you check back here for a response. Being hand sewn, it is easy to sew JUST to the seam line, not to the edge of the block like you do when machine sewing. 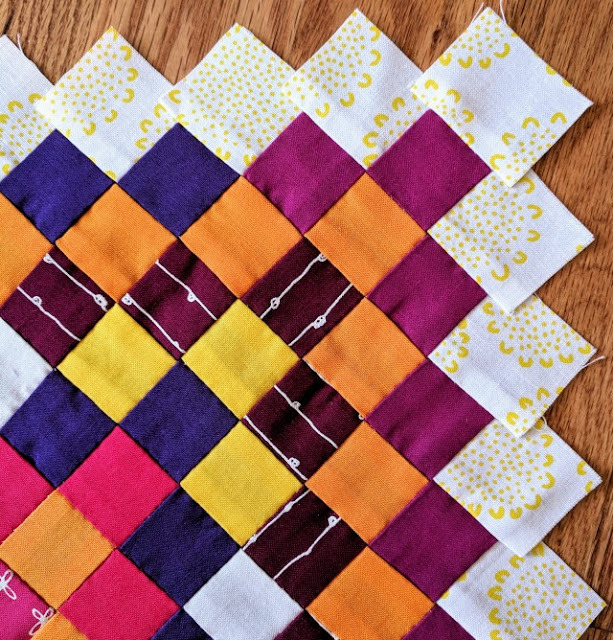 That makes it easy to manipulate the fabric and keep going to sew another block on etc. etc.